One week ago, Terry Phillips surpassed the two-year anniversary of his last United States Modified Touring Series win. After Sunday night’s race at the Mason City Motor Speedway, there won’t be a third. 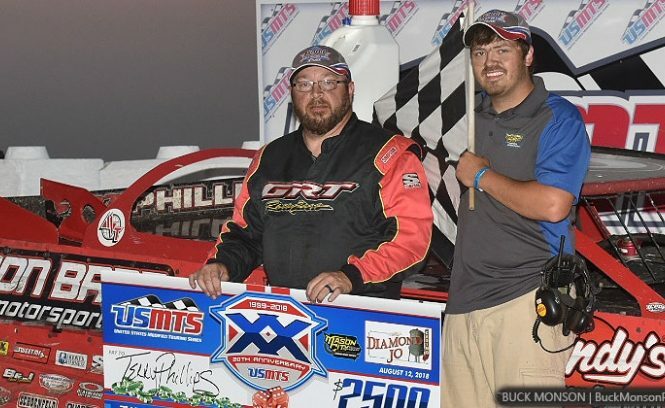 Phillips experienced his share of bad luck during the winless streak, but Sunday night a little good fortune came in the direction of the 52-year-old veteran from Springfield, Mo., when race leader Johnny Scott suffered a flat tire with eight laps to go. When opportunity knocked, Phillips kicked open the door and pulled away from the pack over the last few laps to notch his 25th career USMTS victory—his first since Aug. 5, 2016. 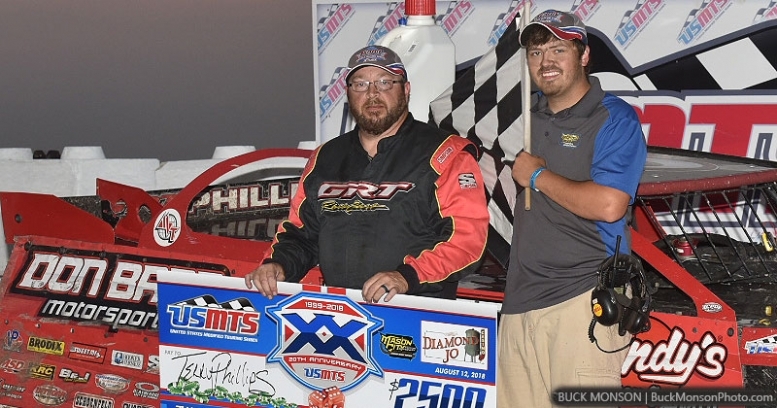 Scott, on the other hand, was well on his way to scoring his third straight win of the weekend and extend his points lead in the USMTS Hunt for the Casey’s Cup powered by Summit before misfortune struck on lap 17. While it’s been a dream season for Scott, it’s been a nightmare for Phillips. But what better time than the 7th Annual Diamond Jo Casino “All-In 77” to turn his luck around? Scaling back his successful late model program this year to focus on chasing the $50,000 USMTS national championship, the title is all but out of reach at this point. But that hasn’t stopped him from digging—and the miles on his tow vehicle are no fewer than if he had one every race this season.